Get the expert support for IT planning you need. Implementing technology without a coherent plan is a recipe for failure and wasting money. Every AIS managed IT services customer has a Virtual CIO (vCIO) managing their account and establishing the strategy for IT. Should your IT strategy shift because of newer best practices? This continual planning process ensures that your IT will always be able to support your business goals – and THAT's what information technology is for. Your virtual CIO has a finger on the pulse of the IT industry and what that means for your business. Your vCIO helps you maintain your IT infrastructure and provide more forward-looking services. For example, a vCIO can work with customers to plan a technology roadmap, identify opportunities to use new technology tools, and ensure we are meeting and exceeding our performance metrics. How's this different from an IT technical advisory service? The main difference is that your vCIO will “go native” and take a broader view of each client, focusing on business and IT alignment. The focus is never on the technology, but on how technology can further business goals. Plan for disaster recovery and address business continuity challenges. 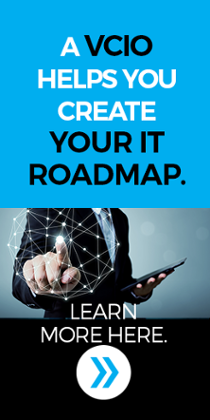 Most importantly, your vCIO will provide guidance in the context of a technology roadmap. The technology roadmap will ensure that your IT will grow logically to match your growing business’ requirements cost-effectively.